Lise Watier wants you to release your inner artist this spring 2015 and become your own canvas with the Expression collection! Palette Expression - $42 - Limited Edition - with five soft yet vibrant shades with a cream-powder formula and finishes that range from semi-matte to iridescent that allow you to express your every mood with multiple colour combinations. Feline Eyeliner HD in Vert - $20 - New Shade - a liquid liner with a soft, high-precision felt-tip applicator for a high-definition line that is super easy to apply and won't transfer. Eye Shine in Expression - $20 - New Shade - creates highly pigmented lines with a metallic finish that applies easily and is long lasting. Ombre Souffle in Fairy Pink - $24 - New Shade - a long-lasting shadow that is a blend of cream, powder and mousse for a silky, airy texture and an iridescent, luminous finish. Expression Blush Trio - $38 - Limited Edition - with three gentle iridescent shades which can be used separately: brown - perfect along the hollow of the cheekbone to structure the face; rose - use on the cheeks for a healthy glow; and orange - place on the temples to illuminate the complexion - or blended together for a beautiful effect on any skin tone. Multifunction Powder Brush - $35 - the ideal tool for all types of powder products, both loose and compact - with long, soft bristles that help powder glide over the face and body for a natural looking result. Rouge Plumpissimo in Rose Nu and Rose Petale - $22 - New Shades - with a rich, creamy silky formula and a subtle glossy finish as well as plumping agents to make lips look irresistibly lush. Rouge Gourmand Velours in Expression - $22 - Limited Edition - offers richly pigmented colour, unrivaled comfort and an ultra-matte look with a smooth, creamy and hydrating finish that keeps lips from drying out thanks to the jojoba oil in the formula. Nail Lacquer in Expression - $13.50 - Limited Edition - with a fine-tip brush and a cap that lights up for an easy application. 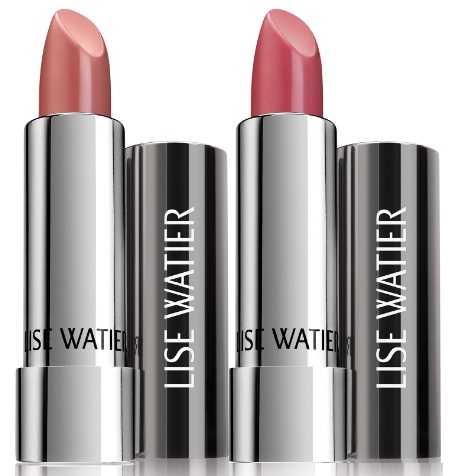 Available now until April at drugstores across Canada and online at www.lisewatier.com. I want that palette oh so badly!